More Vario Boxes Come Again in Consume for Bonus! 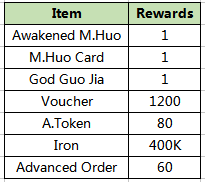 This Consume for Bonus only for Thanksgiving Day! All the reward are wonderful and rich. You can gain corresponding Vario Box and Ordnance as long as your Consuming during the event reaches the specified amount., What’s more, just you have reached the highest amount, you can get Device Box. Join this fantastic event and try your best to get more items!